OK it's an inflammatory headline but hey it's Friday and this is a great film. 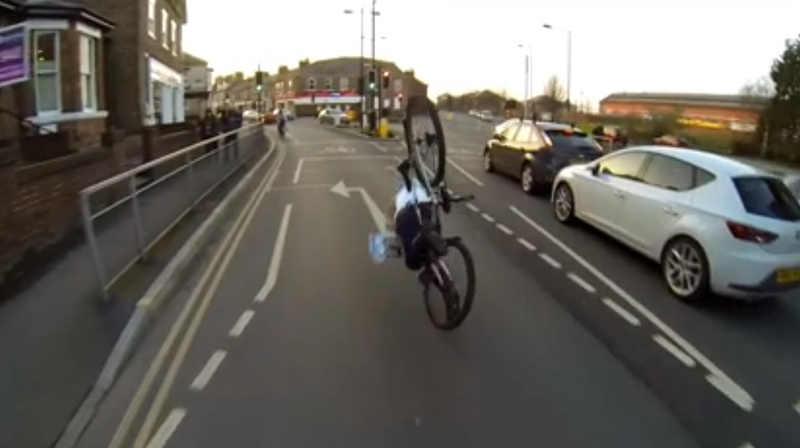 An anonymous cyclist in York, sick of seeing his fellow cyclists break the rules, decide to film their antics from his head cam. Check out the video below, and yes the still is of a chap doing a face plant after taking his jacket off whilst on the move. Whenever a motoring blogger or journalist mentions cyclists behaving in any manner that's less than perfect they are descended on by hordes of yellow jumpered do-gooders. I know, check out the comments under this article - an account of a lovely summer's evening drive partially spoiled by the attitude of cyclists. So whenever a cyclist tells you they are right and you (a driver) are wrong point them in the direction of this video. That'll learn 'em. Thanks to @SpeedmonkeyCol for sending me the video.